Accolades for Track Every Coin! 2013 has begun with a rather wonderful start for all of us associated with the Track Every Coin family. We have been featured on two articles and are overwhelmed to share the news with you. Here are the well researched, well written articles that we are excited to share with you. Congrats for doing wonderful job. I have been using TEC for more than a year and it has helped me a lot in tracking expenses. I just wanted to say that your first post link is not working. Thanks Eshansh for your kind words and the link. Looks like both links works. One is for the mobile and the other works on a computer. Your tool is awesome and simple to use. The desktop app and the web sync is just so useful and thoughtful. No need of internet connection at every point is so cool. Its been about 3 months since my use and I am seeing some useful statistics of the spending. Congrats for the good work u r doing. The app. is of alot of help. Just a quick one. I have noticed while on the mobile app. (using samsung tab) the decimals for the numerals are inactive. So i cant enter for example 3812.22. Decimal points are supported. Please try our mobile site and see if decimal points work for you. It is supported in our platform. I am using the one on the Android Platform and it seems not to be supporting. Please let us know the error you get. I have tested it on android and ios and the mobile web site. decimal points work. Here is a screenshot from and android phone. Let us know if it worked. Thank you for this wonderful app. I was just wondering whether there is an update on the dual synchronization capability of TEC as I noticed the last post was back in 2011 that you will implement this feature in the future. It’s 2013 now, and would there be a possibility that you will roll this ball sometimes soon? Thank you in advance and good job! With a lot of technology change we need to make a few decisions. Our desktop application is a flex based application and now adobe has stopped supporting it. We are considering a new development strategy. Once again, we appreciate you following up. 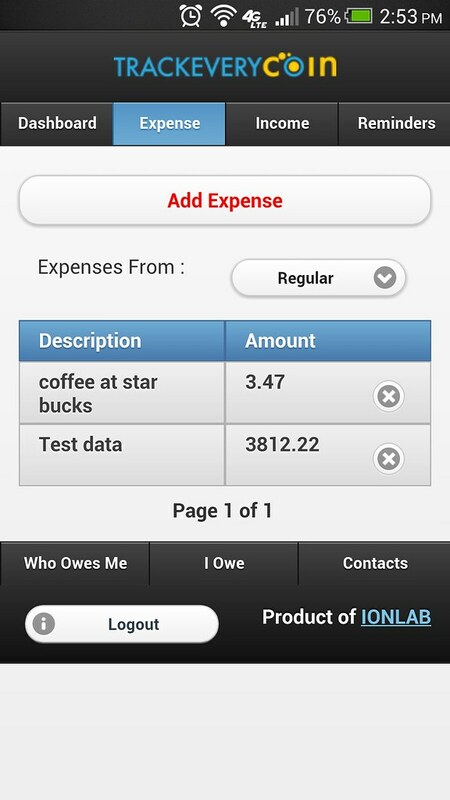 Its very nice application to track the daily expenses. Its very nice application. I just moved from expenseview.com to your application and I really liked it so far, particularly Reminder, Events and Expense graph. But in expenseview.com, it has very good expense search functionality and Ajax implemented which gives very good user interface and performance. The expense search functionality can be used to optimize the (unnecessary or avoidable) expenses to take care in coming months, so as per me its important to have a good and flexible search expense feature. Thanks for you kind words. It means a lot to us. Our search is a work in progress. We will add more functionality going forward. Currently you can search by keywords or any category. You can also narrow down your search results with date range and then search. Vikram on Accolades for Track Every Coin! Vikram on Desktop App Made FREE! Copyright © IONLAB.Know more about us .